Identification Cable Ties offer a quick and simple way to bundle and identify a wide range of wire and cable assemblies with one simple and highly efficient cable tie solution. 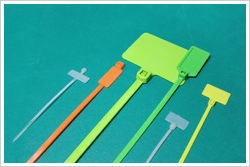 id cable ties for a broad array of cable and wire bundling and identification applications. These marker ties have a flat rectangular area which offer added identification. Available different color. These Flag ties provide a quick and effective method of securing and marking bundles of cables. The ties having a flat rectangular area which can be labelled or written on with an indelible marker to indentify particular bundles of wires, looms or various other items which need to be marked. This marker ties are design to identify the periodic inspections on lifting and rigging equipment.